Dental implants are surgically inserted titanium posts that are affixed to your jawbone and act as the roots of your missing teeth. The titanium material that they’re constructed from fuses with your natural bone, providing a sturdy foundation that prevents any shifting of your other teeth, premature aging and bone degeneration. Don’t worry about the condition of your teeth because the dental implant procedure is designed to offer a remedy for advanced damage to your teeth. In such situations, the decay may be so severe that your teeth aren’t salvageable because too much material has been worn down, thus requiring an extraction. Once your teeth are pulled, it’s imperative to take action to have them replaced. Otherwise, you will suffer from bone degeneration over time. This is because the vacated areas send the message to your jawbone that it doesn’t need to produce as many new bone cells. 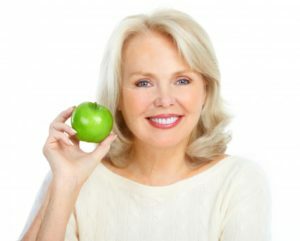 A Remedy for Bone Degeneration? If you’ve already made the mistake of waiting longer than you should have for teeth restoration, don’t worry – your local dentist can still help you. All-on-4 Implants – The All-on-4 implant method uses only four implants per arch, whereas the traditional way would require roughly six to eight. That means that if an entire row of teeth is missing and you’ve suffered some bone loss, this method may be a better option because it requires less places for the implants to affix to your jawbone. Bone Grafting – Another option is to have a bone grafting procedure done. It involves your dentist removing healthy bone from another part of your body or using a special material to replace the loss bone in your jaw. After the surgery is done, you’ll be allowed to heal and then will be reevaluated for the dental implant procedure. You deserve to be happy and fully functional once again. So if you’re missing teeth, then it’s time to seriously consider Lynchburg dental implants to restore your life to normal. Reach out to your local dentist to schedule a consultation today! Dr. James M. Peery, Jr. earned his Doctor of Dental Surgery degree from the Medical College of Virginia and has since gone on to serve his community for nearly 40 years. Still driven to grow and remain abreast of the latest advances in the world of dentistry, he is an active member of several professional organizations. Dr. Peery practices at Peery Family Dentistry and can be reached for more information through his website.